Mahul Brahma is a man with many qualities. 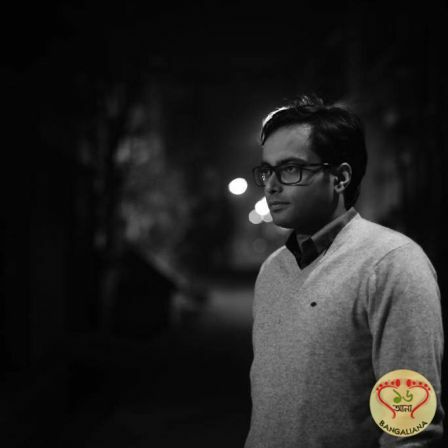 He is an author (his last book was Decoding Luxe), communicator and now he has made his debut as an actor in the upcoming Bengali film Hoyto Manush Noy. Sholoana Bangaliana correspondent caught up with Mahul Brahma in an exclusive telephonic chat. Excerpts..
Priyanka Dutta, Sholoana Bangaliana- How did you bag the role in Hoyto Manush Noy? Mahul Brahma- Well, I did a short film named Elixir. When my friend approached me to do the film, I was surprised as I have no acting experience. I have never done theatre too. However the film was selected at Cannes and was also shown at some other film festivals. It was during that time that one of the directors of this film Hoyto Manush Noy, Kaustav saw my performance and approached me to do this role. He was the assistant director of the film and thought I was perfect for this role. And that is how I bagged my debut feature film project. Tell us something about the character that you play in this film. Mahul Brahma- The character is that of a corporate mid-senior level IT professional. He is very sharp but has his own secrets. He participates selectively in the story-telling sessions of his fellow colleagues (Preetha, Sweta, Mouparna). He has a sense of humour and at times he is flirtatious with his retorts. There is however a story brewing in this cab ride which the audience will know at the end. I am thankful to the entire team of HMN, especially Koustav and Arunava for trusting me with this key role in their debut feature film. Since you do not have prior acting experience, how did you prepare yourself for this role? Mahul Brahma- Well, we did workshops for a year. The rigorous training helped us all a lot. We discussed about the script and we all geared up for the role that we will be playing in this film. An author and a communicator- how did the acting bug bit you? Mahul Brahma- (Laughs) I love facing the camera. The first day I gave my shots for the short film, I was in love with acting. And that is how this love developed. After your debut film releases, how will you balance work and acting if you are offered with more tempting and meaty roles as an actor? Mahul Brahma- Well, I have to apply for leave from work and complete the acting schedules. Mahul Brahma- I have written and directed a short film named Post-It. This is a micro short film of 3 min 50 seconds and the film has made it to the official selections: Best Shorts Competition, California and Calcutta International Cult Film Festival (Best Mobile Film and Best Debut Filmmaker). Tell us something about Post It!! Mahul Brahma– Post-It! is a result of a thought that had germinated in my mind a few years back at Cannes. This is a unique love story where the two lovers are separated by death but they find a unique way to communicate – though Post-Its. This film captures a day in their life over a fight on which film they will watch together – Shoot the Piano Player or Rashomon. I have not only written but also directed and acted in the film. What is next in line from you as an author? Mahul Brahma- Dark Luxe is my next book which will be released after a few months this year. Luxury has its origin in the word luxe, which means dazzle. So, whenever you think of luxury, it is always about razzle-dazzle, it is always about glam and glitz. Behind this razzle-dazzle, there is another life. A life filled with lust, hatred, jealousy, anger. Luxury remains a silent witness to that darkness. Since you featured in a ghost film, which is your favourite horror movie? Mahul Brahma- (thinks for some time) There are quite a few. But I will like to mention a Hindi film named Raat. What is your expectation from your debut feature film? Mahul Brahma– We all have put in a lot of effort and hard work for this film. We had a tight budget, new actors and we did a year long workshop just to perfect our acting skills. That shows our dedication towards the film. Hope the audience appreciates that and people come in huge numbers to the hall to watch this film. We sure hope that Mahul achieves success as an actor just like he tasted success in his other vocations! !